Almost everyone of us rues how kids get attracted and attached and addicted to TV, cartoons and video games these days. As parents, most of us promise to ourselves that we will exercise a strict control over the visual diet our kids consume. However, many a times, we give in to temptation ourselves, or put the children in front of the visual media deliberately to get some peace, or in many cases, to push some food into their food pipes while their eyes are glued to the characters on the screen. I too am guilty as charged. Just that, in my case, my kiddo has no interest in the cartoons or movies or serials (I probably should be thankful for that!). Humans and other living beings do not excite him much, nor do the caricatures that romp on cartoon channels posing as super boys and girls. What my kid loves is – Trains! Yeah! Loads and loads of them. And no, not the train cartoons. Real, moving, huffing, puffing, honking trains. My son is Indian Railways’ biggest fan! So all he wants to watch, is train videos on YouTube, either on my laptop, or on my smart phone. And no points for guessing that the 2 point something lad can nonchalantly access YouTube on my phone without much help from me! Talk about tech savvy kids these days! However, soon I started to realise that it is turning into an obsession. The boy wakes up in the morning and walks straight to my study room where my laptop sits, and demands to watch ‘train’. And if I don’t oblige, he refuses to brush, bathe or drink milk. If I do, he sits in front of it the whole day, not interested in doing any other activity. He even wants to watch them while sitting in the potty! And therefore, the hubby and me embarked on Mission Distraction – from the videos. We went ahead and brought a lot of activity stuff for him – finger painting kits, colour pencils, huge charts for him to colour to his heart’s content. We plan to add on to the list. 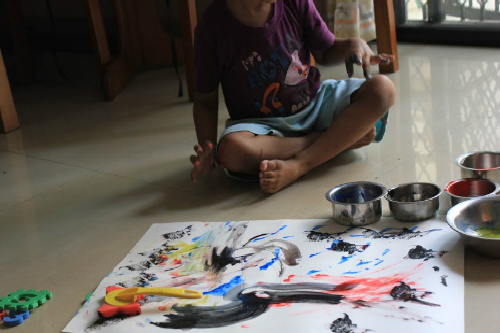 It has given us a ray of hope to see the little one enjoy finger painting, sloshing his fingers in the washable paint and imprinting impressions on the chart paper. It is fun to do this activity as a family. And most importantly, we succeeded in partially weaning him away from the videos. But, for now, it is only partial. He does keep going back to it. And there’s the question of mealtimes too. Being the picky eater that he is, the only way I can feed him a reasonable amount of food is by putting him in front of the video, for I am afraid that if I don’t, he will prefer going hungry to sitting on the table and eating. I hear fellow parents and doctors opining that it is OK to let him go hungry once in a while, so as to let him realise that he does need his food, but the protective traditional ‘amma’ in me keeps stopping me. Maybe I should just ignore her and go ahead and do it, but then there will be the tantrums to deal with. I need to brace myself up for them. Mission Distraction will succeed, won’t it, dear parents? What do you do to distract your kids from the lure of the screen? Do share some ideas, I am sure it will be helpful for a lot of us!